I so totally can’t believe it’s March, where are the days going? 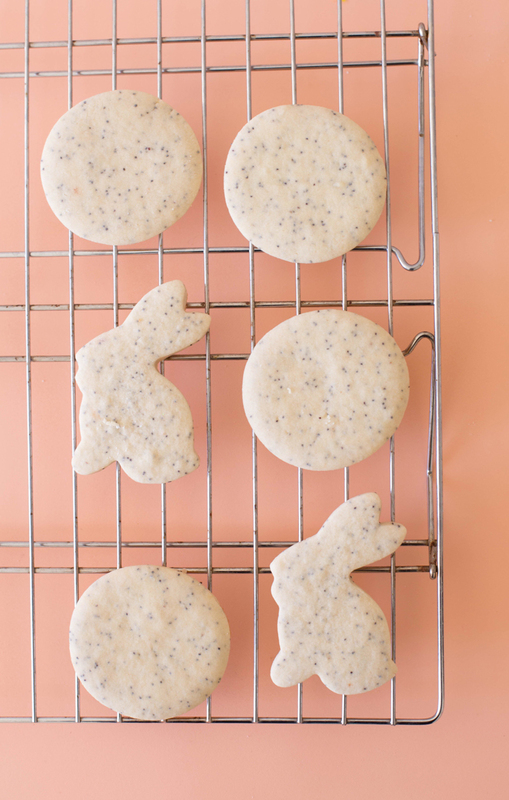 We’re already thinking about spring break ideas, picnics in the park with these yummy lemon poppy seed cookies and Easter that is on it’s way, almost too soon. 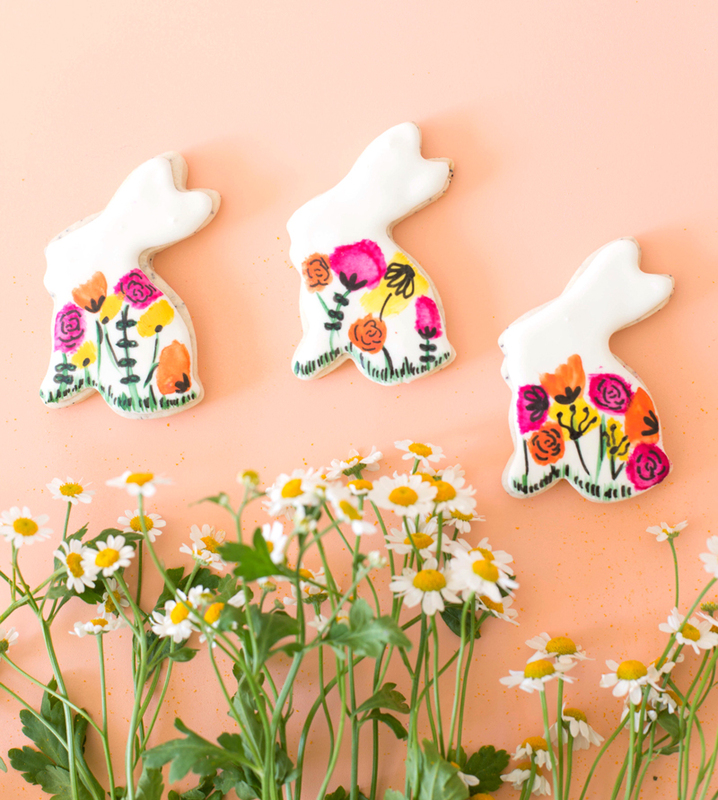 But, I am really excited that we’re getting into spring and that means ALL the bright baking ideas including this easy recipe to create sweet easter bunny cookies & a floral bouquet of spring lemon poppy seed watercolor cookies. I wanted to incorporate my love of flowers along with some of my favorite spring ideas. 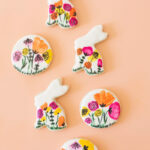 With a punch of lemony goodness and a hint of vanilla, these Lemon Poppy Seed Cookies are the perfect palette to create a set of easter bunny cookies and a spring watercolor cookies bouquet. 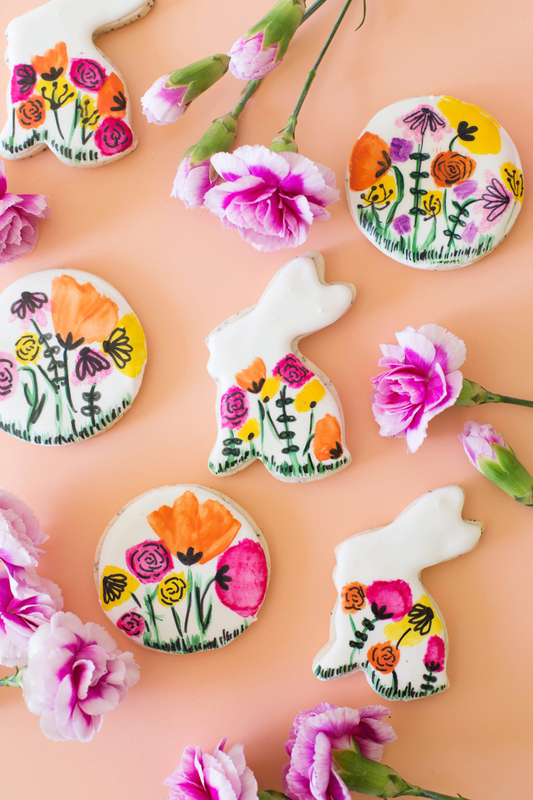 Using a simple watercolor technique we will teach you below and adorable floral line drawings, these cookies are sure to make a gorgeously tasty statement at any upcoming spring fling. Plus, something about the warm weather gives me all the baking inspiration. So let’s get cooking, these beauties are worth it. One of my favorite things about baking cookies is how much sweet goodness you get without a lot of sweat in the kitchen. This recipe is no different! Creating tasty cookies that look amazing even unfrosted to satisfy your sweet tooth without all the hoopla of a cake or other intense baking situation. What a great way to jump into a new season of spring. With a punch of lemony goodness and a hint of vanilla, these Lemon Poppy Seed Cookies are the perfect palette to create an Easter bunny cookies display. To make the lemon poppy seed cookies, start with the bowl of a stand mixer. Here you will cream together butter and sugar, until light and fluffy. With mixer on medium add eggs and mix until well combined. One cup at a time, add your sifted flour to the butter mixture and mix until combined. Next add in your baking powder. Finally, mix in your lemon juice, lemon zest, vanilla extract, and poppy seeds. Shape dough into a round disk and wrap in plastic wrap. Refrigerate dough for one hour. Remove the chilled lemon poppy seed cookie dough from fridge and place on your rolling surface, lightly dusted with flour, and roll out your chilled dough to ¼” thick. I used a 3” round and Easter bunny shaped cookie cutters to create the shapes for the Easter bunny cookies and floral watercolor cookies. Place Easter bunny cookie cut outs on a cookie sheet lined with parchment paper and chill in the refrigerator for an additional 30 minutes. Preheat oven to 350 degrees F and remove chilled cookies. Bake for 10 – 12 minutes until edges are light golden brown. Allow cookies to cool completely before decorating. To make the lemon poppy seed cookie frosting; In the bowl of a stand mixer, fitted with the whisk attachment, whip egg whites on medium until they become frothy. Turn your mixer up to medium high and slowly begin to add your powdered sugar. Next, add your vanilla extract and mix until well combined. Turn your mixer to high, and whisk the icing until you have a smooth a glossy icing, about 10 minutes. You’ll know when your icing is perfect when a ribbon of the icing takes around 10 seconds to disperse back into the mixture. If your icing becomes too thick or too thin you can add a small amount of water or powdered sugar at a time to get the consistency you need. 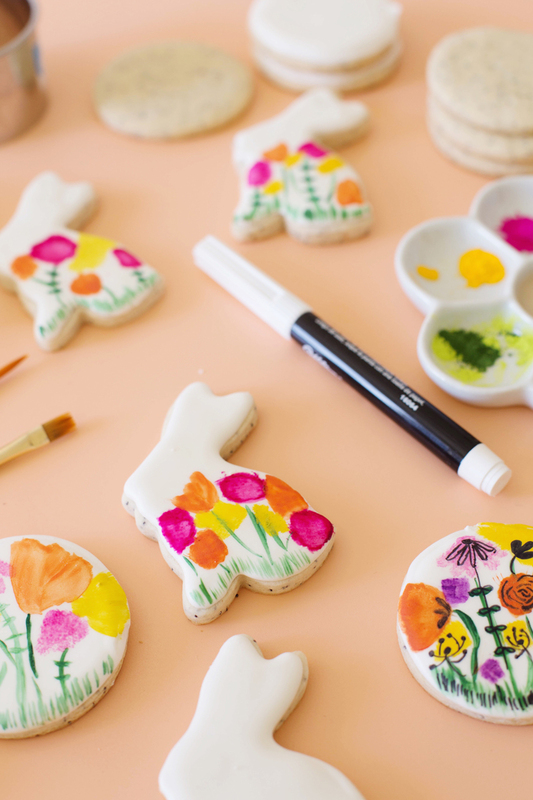 Add icing to a piping bag fitted with a #3 decorating tip to get the perfect watercolor cookie design you want, and create details to your Easter bunny cookies as well. 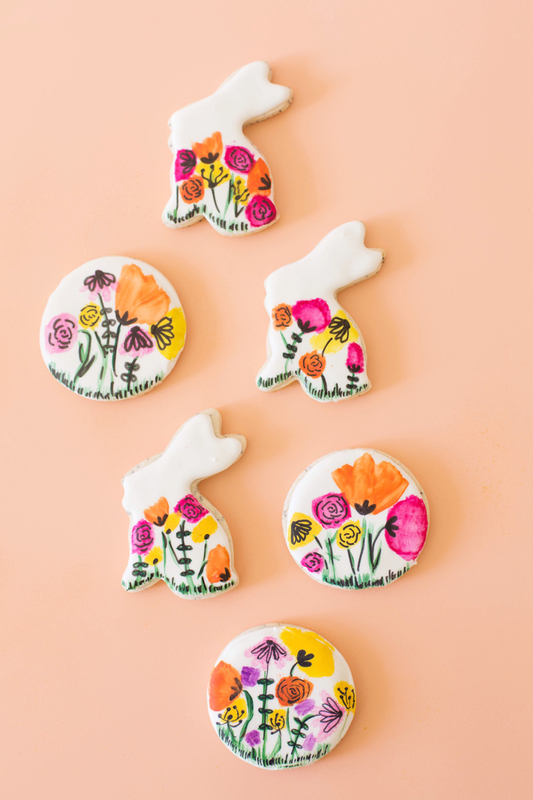 Now that the lemon poppyseed cookies are baked & cooled… adding design to the easter bunny cookies and the floral watercolor cookies is really simple and fun. 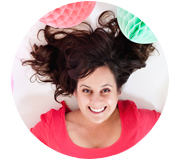 I’ll walk you through the process right now! 1. Once your cookies are completely cooled, take your royal icing and pipe a border around your cookies and fill in with icing. 2. Set cookies aside until completely dry. 3. Place a small amount of each color of petal dust on a plate and pour a small amount of extract in a separate dish. 4. Dip your paintbrush in the extract and luster dust. Paint different areas of your cookie where each flower will be. Do this with each color. 5. Once “paint” has dried completely, with your black edible ink pen draw simple line flowers in each of your colors. 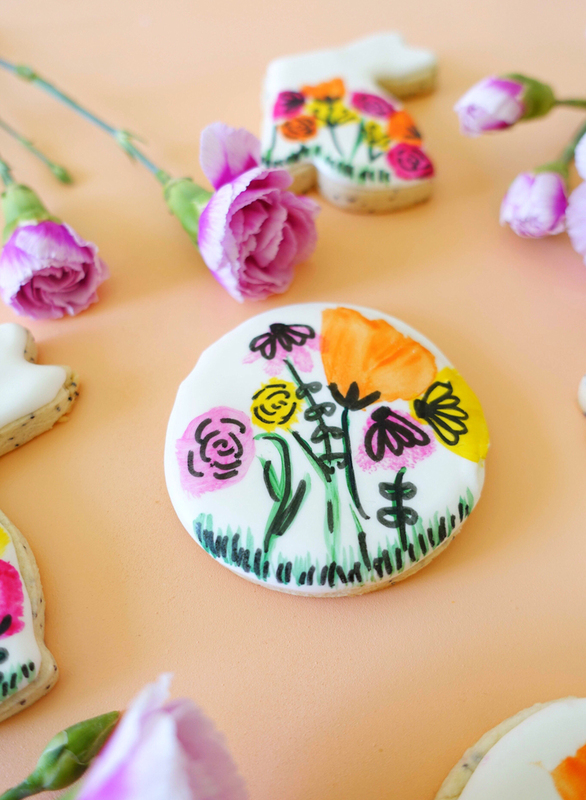 I love the flower line drawings on our watercolor cookies, as they’re pretty simple to create, but are still so pretty and you can even make up your own! The Easter bunny cookies are obviously a favorite as well. Try using different shaped cookies to create a unique canvas for all of your gorgeous spring cookie need. 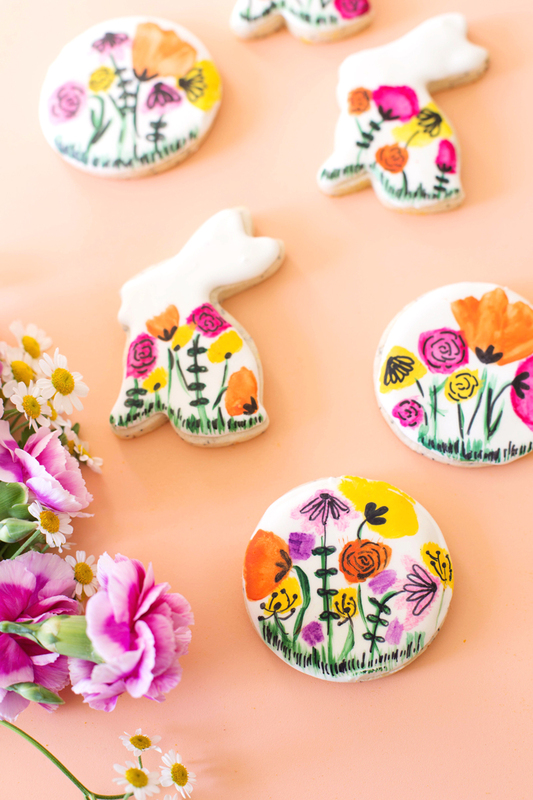 What’s your favorite spring flower and what kind of watercolor cookie flower scape would you create? (Project recipe, styling, and photography @A Subtle Revelry by Brandi Van Leer). These are almost too beautiful to eat. My favorite spring flower would definitely be the tulip. I always think tulip when I think spring. The cake is very funny and beautiful, you make the cake is very handy and persistent. I don’t see the butter listed in the cookie ingredients. How much butter do you use in this recipe?